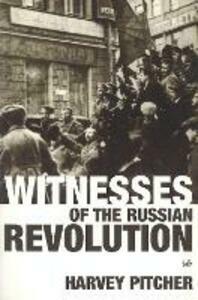 This is a book on the Russian Revolution with a difference. It unites the formal history and the individual memoir by telling the story of 1917 in the words of eyewitnesses who say history in the making. They witnessed two revolutions - the overthrow of Tsarism in March and the Bolshevik seizure of power in November - and described them with an immediacy that later accounts never achieve. These witnesses are British and American rather than Russian: as outsiders, they could see more of the game. They include diplomats, newspaper correspondents, the military, businessmen, even the occasional English governess. There are also adventurous young American radicals like John Reed, author of Ten Days That Shook the World, and unexpected figures like Arthur Ransome, who married Trotsky's secretary and later wrote such children's classic as Swallows and Amazons. Their brilliant journalism has been unread since 1917, while many other eyewitness accounts are published here for the first time. Harvey Pitcher skilfully weaves their accounts into a vivid and absorbing narrative, treating the witnesses' often conflicting views of the Revolution with impartiality and leaving readers free to form their own judgements. In a new Afterword to the Pimlico edition, Harvey Pitcher relates the events of 1917 to what is happening in Russia today.